Summary: (from the inside flap): Aya tells the story of the studious and clear-sighted young woman, her easy-going friends Adjoua and Bintou, and their meddling relatives and neighbors in the golden time of the Ivory Coast in 1978. It's a breezy and wryly funny account of the desire for joy and freedom, and of the simple pleasures and private troubles of everyday life in Yop City. 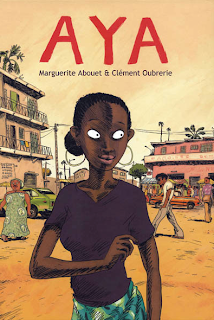 An unpretentious and gently humorous story of an Africa we rarey see--spirited, hopeful and resilient.Aya won the 2006 award for Best First Album at the Angouleme International Comics Festival, Oubrerie's warm colors and energetic, playful line connnect expressively with Abouet's vibrant writing. Review: I really enjoy reading novels about countries outside the United States, perhaps that's because I love to travel so much. I have never been to any West African countries, but a friend lived in Ivory Coast for years so I was drawn to this book when I was looking for a graphic novel to read. And the graphics! They are wonderful and really give the reader a wonderful look into life in Abidjan. The colors and the style are both so pleasing and the illustrations really complement the text. The story was fun as well and I liked that American students who read it will realize that teens (people) all over the world are the same. Aya and her friends go out dancing, make out with boys, flirt, argue with their parents, worry about school work and their future, and they hang out with their friends. There is drama, humor, and poignant moments; this book is a fun and easy read and I really enjoyed it! Was it written in French and translated, or ....? Oh, I wish I could read it in the French mais mon francais is tres mal. I read it in the English translation. I read this and loved. I failed to review it. Thanks for the review. I'm going to link this to Color Me Brown today. Sounds entertaining and educational, thanks for the review! Thanks for the excellent review, and recommendation. I haven't read many graphic novels, but this one sounds really interesting. Ryan (again), I tried to leave comments on your blog and couldn't...not sure why. I'll try again.